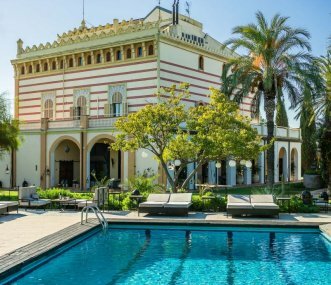 A luxurious villa with 9 spacious suites spectacularly situated on a hilltop, just a few minutes away from the romantic town of Sitges. Private salt-water swimming pool and pool-house with jacuzzi. Huge, modern palatial villa with sea views. 12 big en suite bedrooms all with air con, WiFi, TV, large function/party room and bar, 35m lounge, terraces, cinema room, snooker table, optional catering.